Welsh rarebit, Welsh rabbit, or infrequently rarebit, is a savoury sauce made from melted cheese and various other ingredients and served hot over toasted bread. 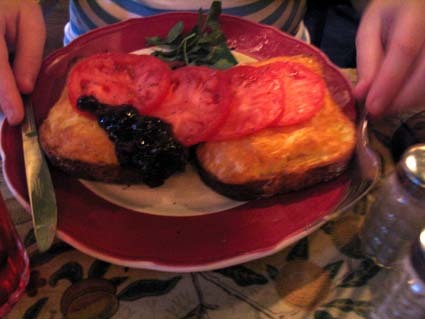 Rarebit is typically made with Cheddar cheese, in contrast to the Continental European fondue which classically depends on Swiss cheeses, and of which Welsh rarebit may be considered a local variant. Various recipes for Welsh rarebit include the addition of ale, mustard, ground cayenne pepper or ground paprika and Worcestershire sauce. The sauce may also be made by blending cheese and mustard into a béchamel sauce or Mornay sauce. Acknowledging that there is more than one way to make a rarebit, some cookbooks have included two recipes: the Boston Cooking-School Cook Book of 1896 provides one béchamel-based recipe and another with beer, Le Guide Culinaire of 1907 has one with ale and one without, and the Constance Spry Cookery Book of 1956 has one with flour and one without. The name of the dish originate from 18th century Great Britain, but the origin of the term is unknown. It may be an ironic name coined in the days when the Welsh were notoriously poor: only better-off people could afford butcher's meat, and while in England rabbit was the poor man's meat, in Wales the poor man's meat was cheese. The term Welsh rarebit was evidently a later corruption of Welsh rabbit. The word rarebit has no other use than in Welsh rabbit and "rarebit" alone has come to be used in place of the original name.